making a ground stone axe. i was thinking of having a go at making a ground stone axe, does anyone know where i could get a nice bit of greenstone or jadite? have you ever made a ground tool? Re: making a ground stone axe. I went to the Jadeite market in Burma and even bought a few pieces of Jade, but a bit far away I guess and a lump that large would most likely be very expensive in this country. I bought a lump the same size as the £32 piece in Burma for a quid. Greenstone is an informal name for a lot of rocks, Greenschist is the knappable one used to make polished axes in this country. you could try entering greenschist quarry, wall and bricks into google. 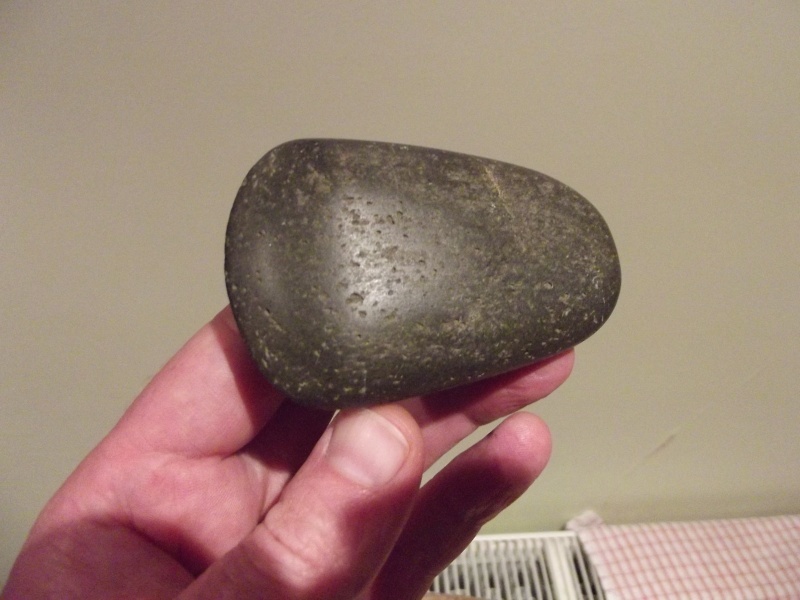 Thanks for taking the time to get the links - thanks for the information - i think it would be Greenschist i am looking for as i would like to try to knap it to a rough shape before the polishing. Are you thinking of grinding it by hand or by machine? 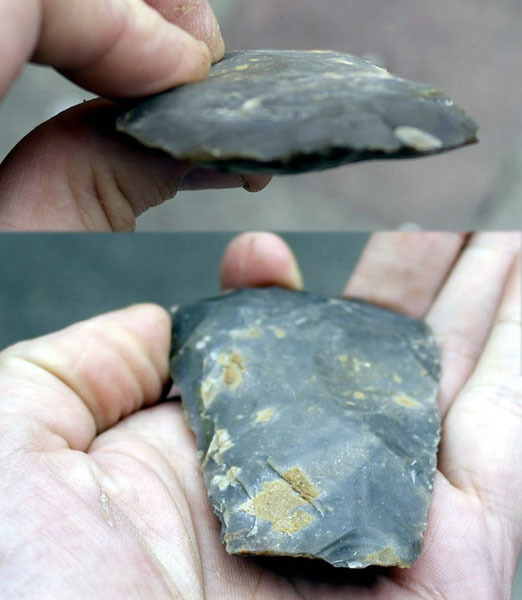 also if you want to do it in flint I could send you a knapped roghout ready for polishing no problem. Gren - thats a great offer and one i might take you up on if i cant find a nice chunk to try myself, thinking about it flint might make a good polished axe. i think i would like to try to polish it by hand but i guess it depends how deep i would have to polish it to remove the imperfections or the deeper knapping marks. Right then, pics taken will post them tommorrow! I'll be back to spend more time with Evans! I used that digital one for years but gave in and picked up a copy from amazon very cheaply last year. The illustrations are actually size so it's very useful. Aha! 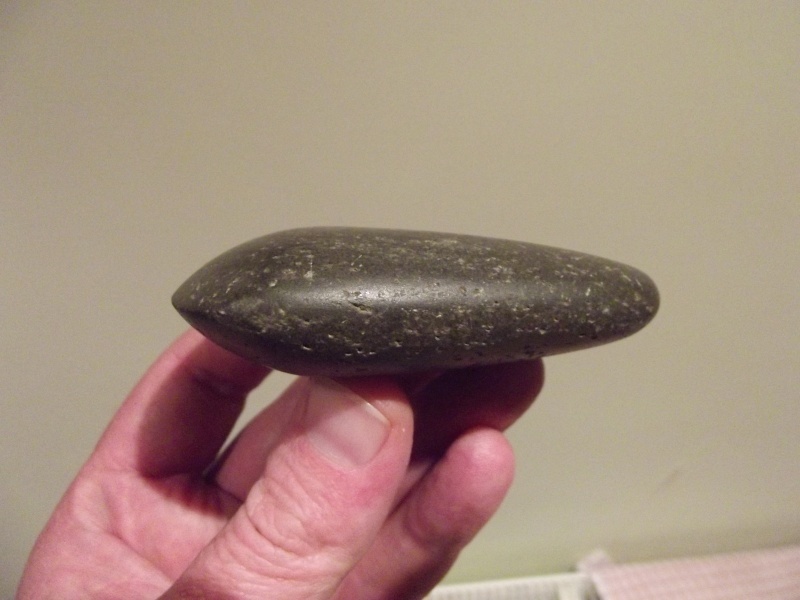 this is the mini green Quartzite axe from a beach pebble (replica), we do have some of these recorded in Norfolk, I would guess these may have been hafted in an antler sleeve and then in to a wood handle. Unless there is some kind of "cult of the axe" amulet thing going on here. Looking at this now it could have been ground further, looks quite blunt but I'm sure I was happy with it at the time. did you polish the axe by hand? - all i have to do now is find a good bit of stone to make one with. Any idea of what you are going to polish it with? Sandpaper seems to work well for me. i was going to try a lump of sandstone in a tub of water as i think alot of polishing would of been done on stone slabs on the edges of streams or rivers? Would sandstone work? Wouldn't that be polishing something harder with something softer? I made the little axe some years ago, I think I roughed it out on an old paving slab, and yes, sandpaper was involved! not sure if sandstone would work now you mention it, hmmm - i was in london today and on the way back called at a few ploughed fields to get some flint - i hope it isnt to weathered, i am going back on sunday so if its ok i will be getting more - and maybe find the odd authentic worked flint. I suppose it's a bad time to mention the Thames beach is made of flint pebbles. Grendel wrote: I suppose it's a bad time to mention the Thames beach is made of flint pebbles. There's also a load of flint nodules, mostly small but some medium size, beautiful black flint. I stuck a video up on how to make a polished stone axe in the Tutorials section. I checked Youtube when we opened this topic and their was nothing, then that one appeared like a Xmas prezzie this week. However I'm not too sure about the technique he uses it seems to me he got a regular flaked axe where the knapper had deliberately put in pronounced flak scars. Presumably if a knapper was making one specifically for grinding he would have made it a flat as possible and that alone would halve the grinding time, also there is still some visible scarring left at the end of grinding from the really deep scars. 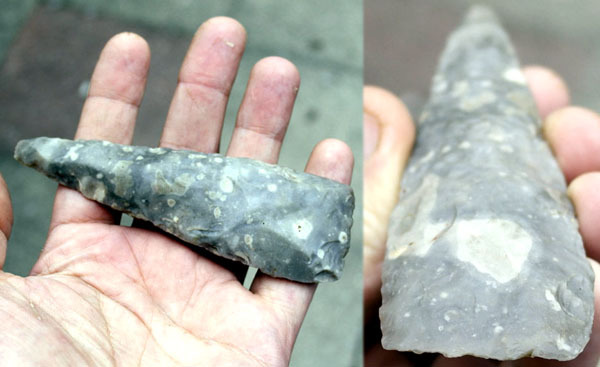 as you say the finished item all depends on the quality of the knap - thanks for posting the link - this is how I see they would be done on sandstone slabs along streams, I must have a go at this but need a flint axe - I think the best would be a nice black flint. I tried to polish this one a while back, one side had much deeper flaking and was more uneven than the other so I quickly worked out if I had knapped it flat life would have been a lot easier. So I knocked out one specially designed for polishing from what I learnt. This one is as flat and even as possible. Another thing I learnt was on the vid it tells you the grind down the edges and sharpen it later, this is good advice as the edges may crumble otherwise. ETA: i tried grinding out an axe from a Quartize cobble a couple of years back, using a paving slab and the experiment did not last, from my own POV i should have maybe used a softer rock for the first effort, and perhaps a more abrasive slab. Not sure that i have the patience for the 20 or so hours work involved to do it the old fashioned way! With the sandstone he uses the sand will come loose and that's what grinds the axe. I guess you could used any flat surface and put a little sand on it. I used a little water and flint dust, but the slab was some kind of aggregate with raised moulded nubs - i have others that i may try at some point, or just cheat and use a power grinder for an inspirational first success. » Looking for a Stone edge TM and Earthquake TM!! !